Wounded Times: Navy Veteran being evicted FROM HIS OWN PROPERTY? Navy Veteran being evicted FROM HIS OWN PROPERTY? Now, the retired veteran is left in limbo, trying to figure out his next move in life. He said, "I bought the place so I could retire here and work in my garage to do my piddling and my projects and all that. So, if I have to move this thing out, I really have no other home." 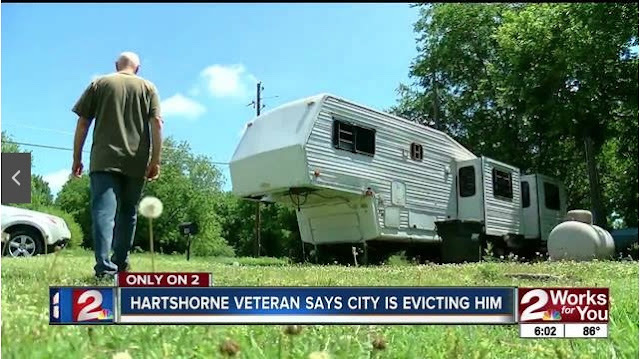 HARTSHORNE, Okla. – A veteran is getting kicked out of his home by the City of Hartshorne. William Smith has called a camper home for the last eight years on property that he owns. Now, the City of Hartshorne is telling him to pack it all up and find somewhere else to live. William Smith said, "The hookups were here: water, sewer, and electric. Everything was here. I just figured since I had already been living in my RV and it was mine and it was paid for and I got my property paid for, I thought I was good to go for many many years." Smith was a Navy radar engineer, constantly moving around. He explained, "To get all of my equipment on an airplane was not a thing that you could really do." He tinkers in his garage on the property, which is the main reason he bought the land, and generally keeps to himself. So, the veteran was surprised when he got a visit from the cops.